Rudy. Made by a friend years ago. Isn’t he sweet? Prince Charming. I bought him a few years back. Can you see the tiny fly on the end of his tongue? If you look closely, you can see my reflection in that purple bulb. There are lots and lots of homemade ornaments but I didn’t take photos because the kids, mainly The Girl, wanted me to take photos of all of hers and not just one or two. I’d need several more posts to cover them all. So I opted for just a few of my faves that I’ve picked up over the years. Most of all though, I just wanted to wish you all a Merry Christmas. This time of year means so much to me and this year, due to some tough times, and some issues that I am still not 100% in the know on, I lost a few close friends. In one sense I am incredibly sad, but in another, I have hope for a very happy new year. All of you reading this know how much I value my friends and I consider each and every one of you, a very dear friend. Thanks so much for making 2010 a very special year. Here’s to a wonderful 2011! 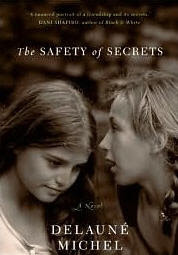 The Safety of Secrets is about friends Fiona and Patricia and how they cope with a secret from their childhood. Working as successful actresses in Hollywood, their lives are filled with work and husbands and memories that they share. After Fiona learns that she is pregnant..she begins to evaluate the relationship she had with her own mother and tries to come to terms with things that happened to her as a child. The author does a good job of describing adolescent angst, but as adults..the characters seemed a bit flat. Especially the character of Patricia. I wanted to see the adult relationships explored a bit more especially once we are told what the secret is. There just didn’t seem to be a lot of interaction between Fiona and Patricia once they were adults. I think it is assumed that because they were such good friends as children, that their friendship remains strong even without the interaction, but the actions of Patricia make me doubt that. Although it was an easy read, I was left wanting more. I received this copy from the Harper Collins First Look program and it includes a reader’s guide. After reviewing some of the questions in the guide, I can see this as a good choice for a book group as there is a lot to discuss. If you give it a whirl, let me know what you think of it.